Once you log in, it would ask you to confirm your information to register with honto. After registering with honto, you would not be able to log in from the bk1 section (on the left side of the login page). 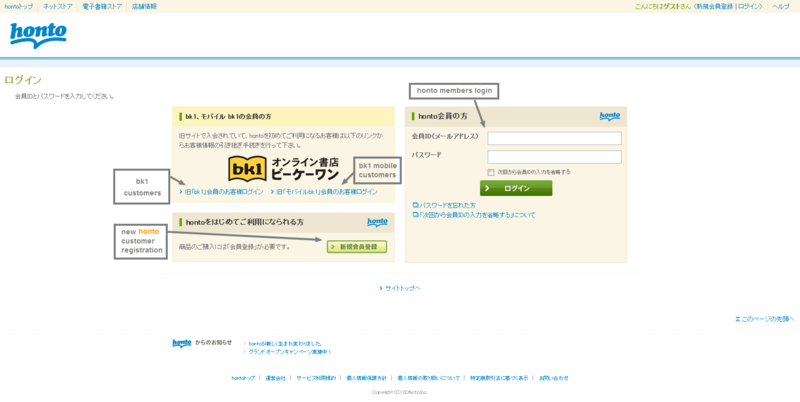 Instead, you would login as a honto member (on the right side) using your bk1 login information (same email/password). honto has a different interface than bk1. the merge gives bk1 a more competitive edge to other online bookstores like amazon. They have more personalized customer pages. For example, on マイページ (My Page), they have a マイ本棚 (My Shelf), where they put all your previous orders’ books into a bookshelf for you to view. You won’t have to look at your own bookshelf at home to see if you own the book already or not… 便利. Lots of other cool things too. Please check it out if you haven’t yet. They currently have a campaign running from 5/17 until 6/19. If you buy anything from honto, you would get 3x the points. More information can be found here (in Japanese). This entry was posted in deals, order, update and tagged bk1, campaign, honto. Bookmark the permalink. I was just about to make a new account to buy something from bk1, now I don’t know how to navigate the signup page… and if I’m not wrong, you can only sign up on honto if you’re local. I don’t think you have to live in Japan to register/use honto, but I have no way to confirm since I’m in the country now. I’ll make a guide on how to sign up to honto and post it up later today. Is there an expiration date or minimum order requirement to use honto points? Typical honto points (received normally through buying items) will expire a year after, on the 1st day of the month it was issued to you. Points accumulated through あしあしと or campaigns have a different expiration date. You can find all your points information/expiration date if you go to ポイント情報 in your “My Page.” It is the first link under the light orange box. The detailed page in Japanese with all of this information can be found here. I don’t think there is a minimum order requirement for using points, but you have to use at least 50 points in one order, which means you have to have at least 50 points. and about the shipping rates? any change ? There is no change to the shipping rates. honto indicated in their FAQ that they only take the actual shipping expenses as shipping fees. If you want to see the shipping rates, they’ve linked directly to Japan Post’s site. You can change it to English on the top right drop-down menu. hi.. Er Honto has been sending us quite a few 500 point emails. I bought some stuff for more than the 3150¥ on May 18, when the first Honto 500 pt email came. They said they will add the points to our account during the 2nd half of the month – it hasn’t been added for me or my other friends who all made those over 3150¥ orders. Is this a japan exclusive campaign? are there restrictions like “only e-books are eligible” etc? Did you buy from honto using the link provided in the email? From what I’m reading, it says to make sure you logged in using the link provided in the email. Ebooks are excluded from the campaign. If you used points to buy during the campaign, the sum needs to be more than ¥3150. The points are added on the 2nd half of the following month after the items are shipped. So for example, if the items were shipped in June, you would get the points mid July. Have the japanese buyers talked about getting the points anywhere like 2ch? I did log in via the link for the second purchase but that was shipped in june… now I have to wait hah… i wish we had something clearcut like the coupon code. If you logged in through the link in the honto email, you should get the points. I don’t go on 2ch, but I looked it up and a person did post that there was a change to the points distribution for the 500 points email starting from the 2nd email. So the points seem to be time sensitive for their usage. Thank you so much for looking up 2ch for me too :DD! Not credited yet. I’d made a 2nd order for more than 3150.. I’m just happy with the 500 i got :3. Hi, I was wondering if you know anyone that had a problem with credit cards? I was an original bk1 customer and had no problems buying but ever since they changed to Honto my cards have come back saying they’re not valid (which is not true, perfectly usable here). Actually, this is what it says; クレジットカード情報が有効ではありません. Sorry for the late reply. Someone else had a similar problem with their VISA card showing up as invalid sometimes. Daniel posted in the comments section of the other honto post that changing payment methods could possibly solve the problem. More details here. I’ve also made a follow-up post with pictures on how to accomplish this underneath the posts.